Laysan albatross are the kind of bird we fall in love with. They possess faces made from the strokes of an artist's paint brush. They glide with their six-foot wings stretched wide and swoop in gentle arcs up and over ocean waves. Laysan albatross are the kind of birds that make us humans long for wings with which to take to the air. They are the kind of bird that makes even those among us who don't consider themselves birders become birders. I believe one of the reasons we fall for Laysan albatross is because we see so much of ourselves in them. And when it comes to the human emotion of love that we celebrate every Valentine's Day, Laysan albatross have much to teach us. 1. This time of year in the Laysan albatross world, mates are taking turns guarding their newly-hatched chicks on their nests. Both the male and female participate in the rearing of their young, and with their four-inch long bill that rip apart squid and a flying fish, the parents will tenderly preen their young chicks, small enough to fit in the palm of a human hand. 2. 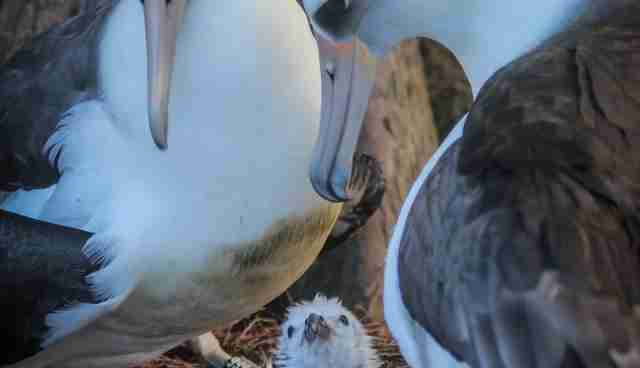 Laysan albatross are over-the-moon dedicated to their chicks. So dedicated are they, that when their mate returns from a week's foraging bout at sea - during which time the sitting parent hasn't eaten a thing - they don't hop off their nest and race off for a good meal. In some cases, their mate has to bodily hip-check its way onto the nest. And still the hungry parent may not leave the area right away, choosing, instead, to preen its mate or coo to its chick for a few minutes or hours before tearing itself away to fill its belly. 3. And that meal they fly away for? 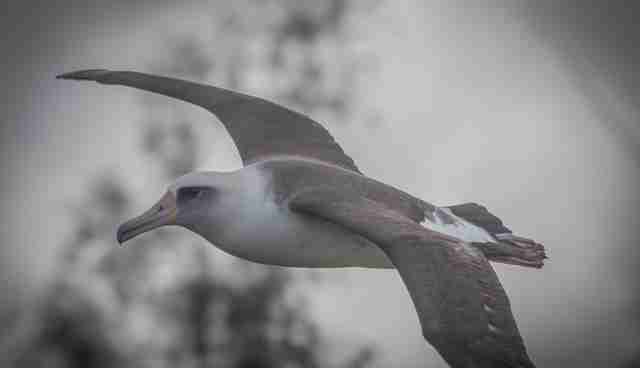 Laysan albatross will venture several thousand miles round-trip for a good meal of squid and fish eggs, as far as the Aleutian Islands off Alaska. They will do this for five-and-a-half months, returning every week or two, to regurgitate their catch until their chick is old enough to fly and find its own food. 4. Once the chick fledges - flies for the first time - it will head out to sea for the far horizon where it will live for the next three to five years without touching land. Then, when something tells them it's time to contribute to the overall Laysan albatross population, they will, most likely, return to the spot where they hatched in order to find a mate. But they don't just take any mate. They will spend the next three to five years performing elaborate courtship dances with a number of other Laysan albatross before choosing one with whom they will raise chicks together. 5. Perhaps Laysan albatross take their time in selecting a mate, because, generally, they make long-term commitments to their spouses. The oldest known wild bird in the world is a Laysan albatross named Wisdom who is, at least, 64 years of age. Conservatively speaking, she has raised 35 chicks in her lifetime, possibly, although this isn't known, with the same mate. 6. Not that there haven't been divorces. Or the loss of mates due to deaths. But when this happens, Laysan albatrosses don't swear off love altogether but diligently go about finding new love. 7. Laysan albatross are what's called synchronous nesters. That means the entire species hews to a set reproductive calendar. 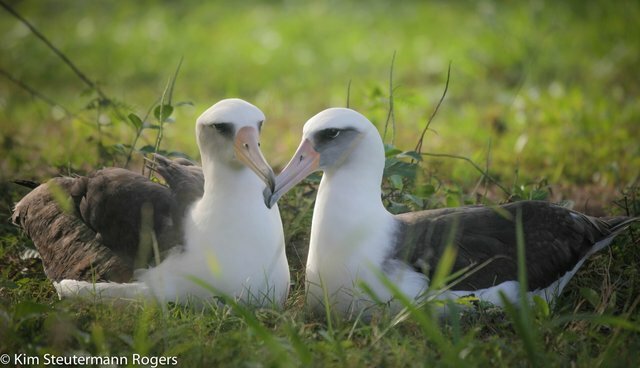 Since Laysan albatross live solitary lives, they agree to a "same time next year" principle of married life. Typically, the male arrives at the nest site first and patiently waits for his mate to arrive. Sometimes he gets the timing just right so all he has to do is wait a few hours, sometimes it's a few days, other times, an entire week. And when his mate does arrive, whoa, the love fest is instantaneous. There is no longer any need for dancing; that's the business of courting birds. These birds are already committed. Instead, there is snuggling. Nuzzling. And, of course, the business of reproduction. Followed by more snuggling and nuzzling and gazing into each other's eyes. So, you've got the beauty and the dynamic soaring. Then, it's the love exhibited by these birds - for their mates, as well as, their chicks - that makes a human being envious enough to long to be the seabird known as a Laysan albatross. At least, that's true for this human being. Seven Things Laysan Albatross Teach Us About Love first appeared at www.kimsrogers.com.